Are you having a hard time trying to find that perfect gift for someone? 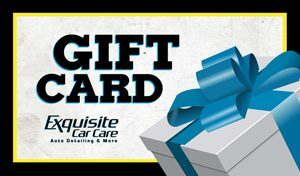 Why not a gift card from Exquisite Car Care? Our Gift Cards make the perfect present. Everyone wants a clean car! So remember when you have a need to purchase a gift, keep us in mind. Everybody appreciates a clean vehicle. So give them the gift of CLEAN. Stop by our office and pick them up or give us a call with questions. Join us on facebook for new specials and coupons! Join the Club!